Those of you who have been following my blog for a while will know that one of my many passions is astronomy and to a growing extent astro photography. Tonight sees the peak of the Quadrantids meteor shower. The Quadrantids is the first meteor shower of the year with it’s peak being the early hours of tomorrow morning. It’s named after a now defunct constellation Quadrans Muralis as the stars from the constellation have been ‘rezoned’ in recent times into adjacent constellations. It’s a little unusual compared to some other better known showers such as the Perseids as it peaks so quickly, a matter of hours rather than days. It’s also a bit odd as it is one of only two (the other being the Geminids) that has an asteroid as its parent body. In most cases meteor showers are linked to comets but in the case of the Quadrantids the likely source is the asteroid 2003 EH1. It could be that this is a dead comet, one that lost its ice and is now just composed of rock. The weather has been awful here the last couple of days and sure enough, I’ve just looked out of the window and there’s plenty of cloud cover and heavy rain again so no views of shooting stars for me tonight. It was a little different a couple of years ago though. With excellent clear skies I wrapped up warm, grabbed my camera gear and ventured into the garden. It was pretty breezy but luckily the trees in the garden were acting as partial windbreaks. I didn’t have to wait long to witness the first meteor. A rapid bright white streak shooting across the sky exactly where I was looking. I’m not sure whether its a good thing to see such a corker so early on as it builds up ones expectations considerably! Needless to say I positioned the tripod, attached the camera and got everything set up as quickly as I could. 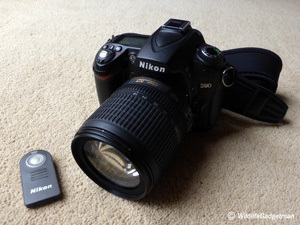 I used a very simple set up for most of my astro photography back then consisting of a Nikon D90 with the essential wireless remote trigger that I mounted onto my trusty Manfrotto tripod. ISO is usually set to around 800, aperture fairly wide open and the shutter set to the ‘bulb’ setting for extra long exposures. 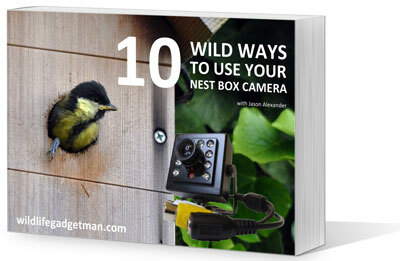 I then set the camera so the shutter opens with the first click of the remote and then closes with the second. 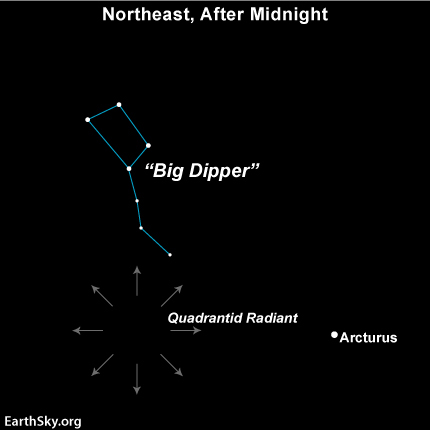 The Quadrantids meteor shower in 2014 didn’t disappoint! 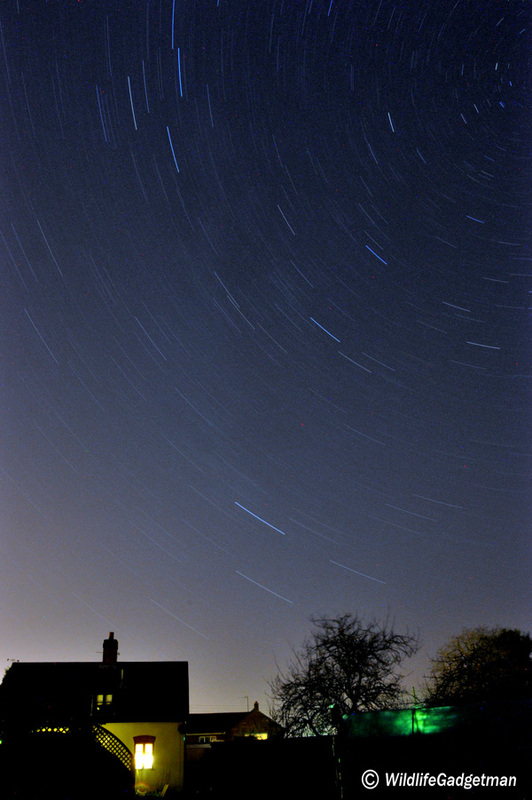 In the two and a half hours or so I was watching I saw in excess of 30 meteors, not bad for such a light polluted area! Many were small fairly faint streaks rapidly chasing across the sky but there were three or four that registered quite highly on the ‘wow’ factor with one in particular that rates as one of the best meteors I have ever seen! Star Trails But None Shooting! Unfortunately I didn’t manage to capture any meteor trails in any of the photographs. It would have been the icing on the cake if I had but I enjoyed the heavenly spectacle anyway! In previous posts you may remember that I occasionally dabble in ‘Light Painting’. 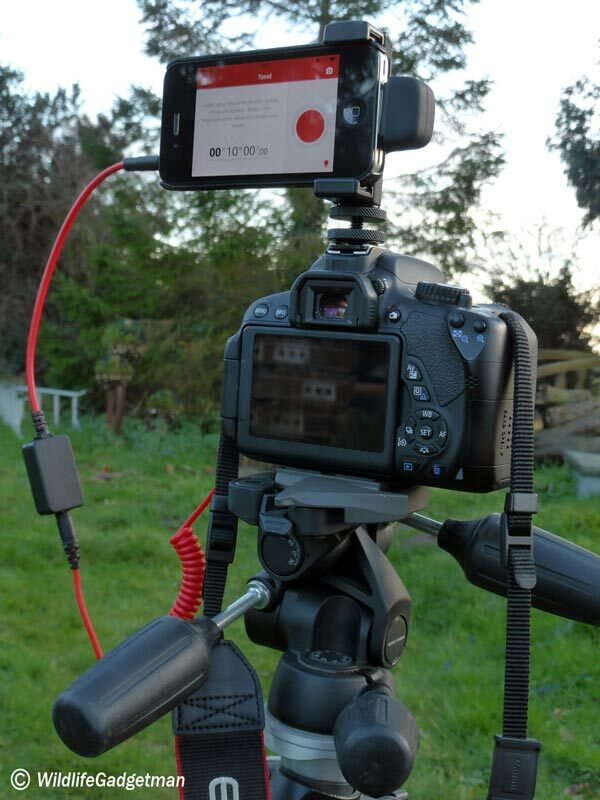 The set up required to do this is exactly the same as for astro photography. The difficult part is creating and capturing something recognisable with your torch! I was really pleased with how this turned out, and on only the second attempt too! My confidence was growing at this point so I thought I would attempt something even more ambitious! 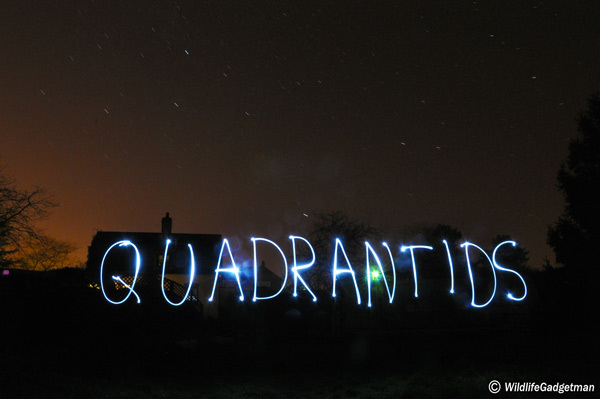 As we were watching the Quadrantids meteor shower could I manage to spell that out too with the torch?! My Best Shot Of The Quadrantids! Again, second attempt and….BINGO! All the letters evenly spaced, the same height and pretty central in the image. To say I was happy was an understatement! Ok, with an eleven letter word under my belt could I go further? Light painting is a great measure of your spatial awareness and the more complicated the shape or the more letters you add the harder it gets. 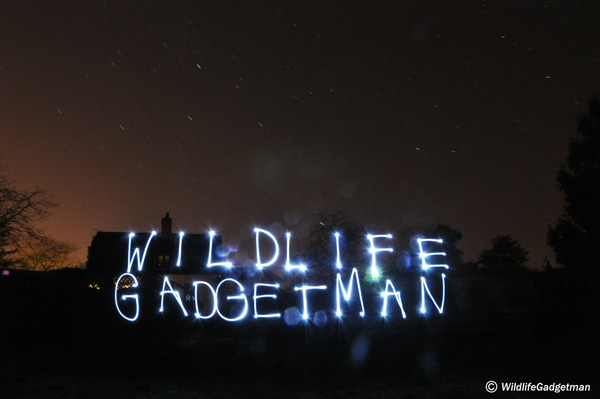 Now for my ultimate challenge of the evening, could I spell out ‘WILDLIFE GADGETMAN’?! Always up for a challenge I had a go, and then another go, and then another go. Then, on my fourth attempt I cracked it! BINGO! I’ve always wanted to see my name in lights! After that I tried it three or four times more and got very similar results. Well, I may not have captured any Quadrantids meteors on a photograph but I saw plenty and had great fun creating some nifty light painting images to add to my collection. 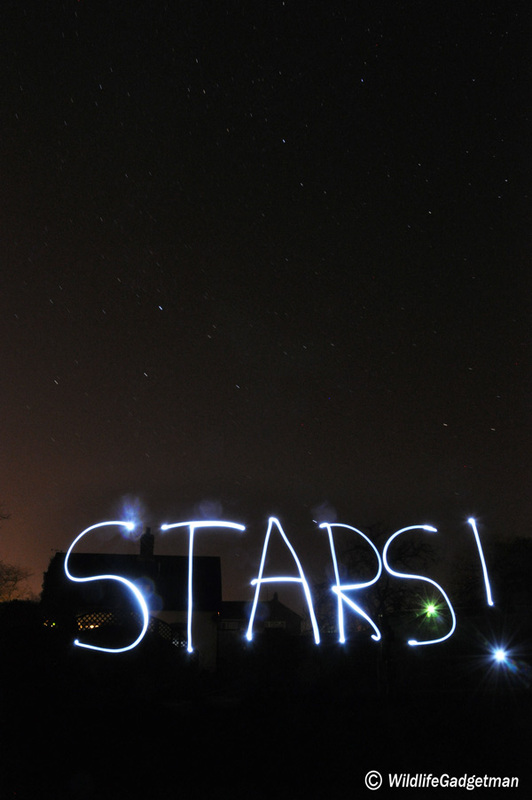 Star gazing is great fun as is Light Painting. If you haven’t tried it have a go this year. I’m sure you will love it too! With cloudy skies overhead I won’t be seeing any meteors tonight. Take a look out of your window and see if you have clear skies. If you do, wrap up warm, venture out in the garden and look up. You might just be amazed at what you see!